I could spend hours in Pinterest. Actually, I do spend hours on there. There so many amazing ideas things people have made that I want to try myself. So I pin them and they go to rest in my Crafty Ideas Pinterest board never to see the light of day again. Until today! Mostly because this was an easy idea and also a simple fix to something that has bothered me since the day I got them. My problem: two keys that look exactly alike and always get mixed up. It makes getting in the door with an armful of groceries so much easier. I cant believe I didn't do it sooner! 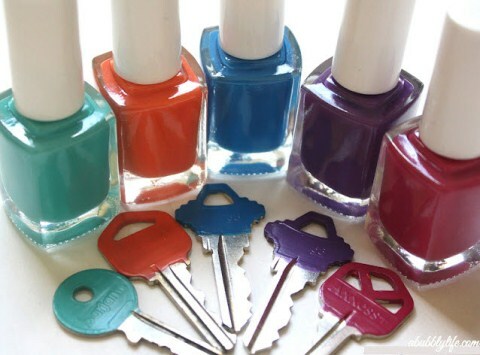 So this weekend go get the nail polish out and paint those confusing keys! So cute! Useful and pretty at the same time :) Have a great weekend. Country Chic- I wanted to paint my husbands so bad, but he just was not having the pink glitter. He did, however, say I could paint his royal blue. So I have to get out my royal blue nail polish this weekend and do his. That's a super great idea! I have the matching keys problem too! Also, I'm doing a pillow giveaway over at my blog. I'd love for you and your readers to enter! What a fabulous idea! Much better than the rubber covers to distinguish keys. such a simple but creatively brilliant idea...now why in the world didn't *I* think of that! so fabulous! love it! Adorable! I have to do this over the weekend! Heeheee it is super cute and have seen some chic versions b4 in glittery gold, but I think I will do it this week so I to can also say that I actually did something from Pinterest! I have an entire board on cool DIY`s, have I done any yet....noooooooo. I am just like you, I am pin crazy but haven`t gone back to most pins. I like to think it is because I have an amazing memory and don`t need too look at them again for now...yeah right! Glad to see you are the same. 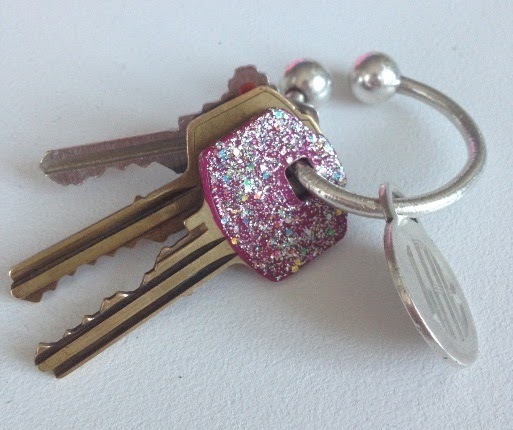 Every design diva needs glitter on their keyring! Great idea. I can relate so much! Glad to follow your account in there. Love this key make-over. :) Got my eye on your next posts. I love this idea. Fun!